What is a "Pluot" Anyways? The word "pluot" came on my radar for the first time last year. Before then if you asked me what a pluot is, I would not have any clue. My friends and I have a joke going for these kinds of strange, unknown, heard-for-the-first-time kind of words, while playing Scrabble. As a part of the joke one of us asks to "use it in a sentence" to challenge the person who used it --and usually someone responds with something like "Some of my best friends are pluots." Let me go back to the first time I heard the word: I was at Publix Supermarket in Palm Coast (the one located on the corner of Belle Terre and Palm Coast Parkway). They called them "Dinosaur Egg Pluots" --a fruit that looked like a cross between a nectarine and a large plum. I never heard of them, never saw them, but they looked good and I bought them. What can I say? They were delicious! I didn't know why they are called pluots, because they tasted much like plums. Few weeks ago, they popped up at Publix again. This time there were more choices, the dinosaur egg pluot, yes, but also a deep red one, too. I bought a few of each of them. At the check-out counter, the cashier pointed to the dinosaur egg pluots, and asked me if I knew what this fruit was as they did not have a tag to identify them. I proudly answered "Dinosaur Egg Pluots!" She laughed, but punched it in the system, and said "oh, yeah, that's what it is indeed." As she was scanning the rest of the groceries, we launched into a conversation with the cashier and the older gentleman who was bagging the groceries, talking about how strange of a name/fruit it was. They asked me how it tasted, and I said "pretty good." That's when it occurred to me: Is this an invented, genetically engineered fruit that did not exist before? We chatted about that a little bit with the cashier and the bagger, too. When I came home I went straight to Google --and indeed found out that this is a "made-fruit." 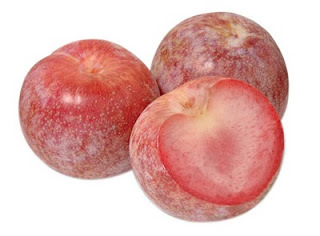 A "pluot" is a tradename for varieties of interspecific Plum developed in the late 20th century by Floyd Zaiger. In the United States, the fruit is known by most regulatory agencies as an Interspecific Plum or Plumcot. It is a complex cross hybrid of plum and apricot, exhibiting more plum-like traits. The pluot, like the "aprium" is derived from plums, apricots and or hybrids called the plumcot. Floyd Zaiger (born 1926) is a biologist who is most noted for his work in fruit genetics. He also founded Zaiger's Genetics. He was born in Nebraska and grew up in Iowa. Zaiger has developed both cultivars of existing species and new hybrids such as the pluot and the aprium. So there it was, this is indeed a made, an invented, a genetically engineered fruit, that is now making it to the mainstream supermarkets! Why do they do that? Why would anyone mess with mother nature's blessings like plums and apricots, to come up with a plum-like fruit, called a funny name like pluot or apricum, and push it to mainstream Supermarkets all the way to Palm Coast, Florida --though even this blogger spell-check is not recognizing these names? Most folks today (including religious or non-religious folks, humanists, spiritualists, and realists) believe that every being and every vegetation is on this earth for a particular reason. Whether you call it God's purpose or thousands and tens of thousands of years of evolution, all beings fit in this world and they serve a purpose. Do we even know the long term implications of messing with the genetics of plants, vegetables, fruits, and animals? by Ky Ekinci: Ky is a management consultant, and an entrepreneur based in Palm Coast, FL. He’s a co-founder of Office Divvy. Ky’s career in the travel industry has spanned the globe. He has held senior management positions with several well-known national companies in the U.S., and has been responsible for numerous large projects as an executive, including one of the biggest United Nations events in the world. Ky has a master’s degree from Cambridge College in Management. He can be found on twitter @KyEkinci. iPad: Is It The Solution For The News Industry? Who's Talking about "Flagler Beach" on Twitter? Will Book Stores Go Away As eBooks Take Hold? Who is talking about Flagler County on Twitter?